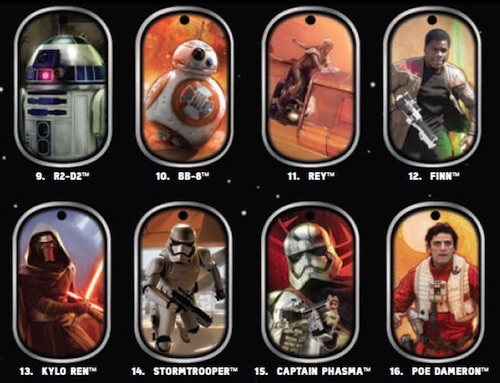 Presenting collectors with a different way to honor their love of Star Wars, 2015 Topps Star Wars Dog Tags are one part collectible and one part fashion accessory. The simple release includes a base set and one limited parallel for Star Wars: The Force Awakens. There are a total of 16 different dog tags to collect, but most of the subjects have two options that each feature a different image. Exclusively covering Episode VII, there is a strong focus on the newest characters, including Kylo Ren, Rey, Finn, Poe Dameron and Captain Phasma. Familiar names, like Chewbacca, C-3PO and R2-D2, are also available. In addition to the base dog tags, Gold parallels can be found at the rate of 1:24 packs, or roughly one per box. 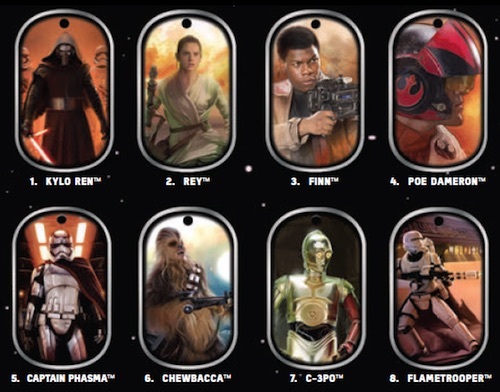 Topps has previously released dog tags for a variety of franchises, including WWE. 16 tags. Shop for dog tags on eBay.